EVERY day Brisbane taxi driver Aguek Nyok passes the bus stop where, a year ago, he kicked in the door of a burning bus to save 11 passengers. The Catholic father-of-four and former South Sudanese refugee still relives the horror and terrible coincidence of seeing the bus driver burnt to death in the driver’s seat, after the bus was firebombed. He later learned the bus driver was his friend-for-life, Indian-born Manmeet Alisher. They had once been taxi drivers together, using waiting time at taxi ranks to share their stories, dreams and aspirations in their adopted Brisbane home. Mr Alisher shifted to bus-driving three months before the horrific attack, as he attempted to work more regular, family-friendly hours. On the anniversary of the tragedy, October 28, just near the Moorvale bus stop on Beaudesert Road, Moorooka, tiny Luxworth Place was renamed “Manmeet Paradise Park” and a memorial unveiled – honouring Mr Alisher, a popular singer, actor, social worker and a well-liked figure within the Indian community. Mr Nyok said he would come, sit and reflect in the park whenever he could during his 12-hour cab shifts. “One of these days, who knows I will be sitting next to my brother Manmeet,” he said. “I would like to say to him now we are sitting in your house. A memorial plaque honours Mr Alisher, also known as Manmeet Sharma, and a timeline explains the heroic actions of Mr Nyok, as well as the police and fire service that responded at the scene. Another man honoured in the timeline is truck driver Peter Buxton who, like Mr Nyok, saw the burning bus and ran towards it while others fled. Mr Buxton ran to the front door with a fire extinguisher and did what he could, staying with Mr Alisher until firefighters arrived. 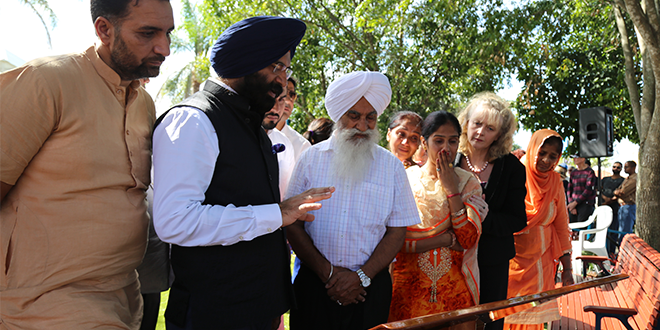 Mr Nyok had planned to travel to Manmeet’s village in Punjab state to grieve with the Sharma family on the anniversary, but as it turned out the family flew to Brisbane, attending a ceremony at the Guru Nanak Sikh temple at Inala, and then the memorial-unveiling of “Manmeet Paradise Park”. “My heart is full of grief, I don’t know what to say, what not to say in this place after one year,” Mr Alisher’s brother Amit Sharma told the memorial service. Mr Sharma said the family’s overriding concern was ensuring justice for Mr Alisher, and he had come to Australia with no joy in his heart. A man charged with murder is yet to face court and the family is seeking justice. The accused has been charged with one count of murder and 11 of attempted murder. He cannot be identified for legal reasons. As a result of Mr Alisher’s death, Brisbane City Council agreed to fit all of its bus fleet with rear emergency exits in a bid to improve passenger safety.